Get FREE Travel Kit when you buy from Himalaya Store. This is not all you will get 10% Flat off also. Himalaya Store have a great variety of products and they are very reliable too. 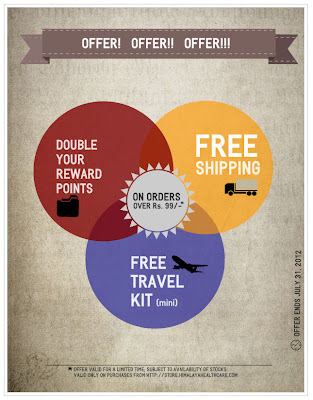 How to get Free Travel Kit + Flat 10% Off on purchase of Rs 99 & above? Use coupon code survey12 for flat 10% Off + You get Himalaya Travel kit free. Futurebazaar is giving Rs 150 Off on purchase of Rs 151 & above purchase for new accounts on Futurebazaar. Just follow the steps below to grab Tantra women Tee worth Rs 299 @ just Rs 79 including Shipping charges. How to get Tantra Women's T-Shirt worth Rs 299 at just Rs 79?